Increasingly sophisticated hardware and software technologies are being developed to deliver innovative new personalized health care interventions by researchers. Digital games are rapidly becoming an important tool for improving lifestyle habits, behavior modification, self-management of illness and chronic conditions, and motivating and supporting physical activity, according to a provocative Expert Panel Discussion in the premier issue of Games for Health Journal, a new bimonthly peer-reviewed publication from Mary Ann Liebert, Inc., publishers (http://www.liebertpub.com). The premier issue is available free online at http://www.liebertpub.com/g4h. 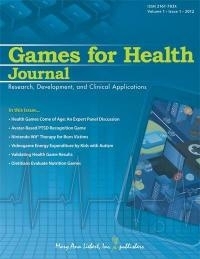 The Journal will be the only source for a broad range of hard-to-find and timely information related to health games. For example, the first issue offers a unique Roundtable Discussion, "Health Games Come of Age," an insightful conversation with leaders in the games for health field. Tom Baranowski, PhD, Baylor College of Medicine; Peter Bingham, MD, University of Vermont; Debra Lieberman, PhD, University of California, Santa Barbara; Ernie Medina, DrPH, Medplay Technologies; Jesse Schell, MS, Carnegie Mellon University; and Sam K. Yohannon, PT, MS, Cornell University Medical Center share their unique approaches and the creative evidenced-based outcomes research that has brought health games to the forefront of innovative patient care. The Journal breaks new ground as the first to address this emerging and increasingly important area of health care and will provide a bimonthly forum in print and online for academic and clinical researchers, game designers and developers, health care providers, insurers, and information technology leaders. Articles in the Journal explore the use of game technology in a wide variety of clinical applications in disease prevention, promotion, and monitoring, including nutrition, weight management, medication adherence, diabetes monitoring, post-traumatic stress disorder, Alzheimer's, and cognitive, mental, emotional, and behavioral health. The Journal is under the leadership of Bill Ferguson, PhD and a distinguished editorial board (http://www.liebertpub.com/editorialboard/games-for-health-journal/588/) including leaders from academia, health care, information technology, and government. A clinical brief on "Evaluating Efficacy and Validating Games for Health" suggests the importance and process for objectively assessing the results of games used to improve patients' health. A fascinating interview with Ben Sawyer, Co-Founder of Digitalmill—"Games? Seriously!" --explores the driving forces in the field and the gamification of health. "The growing breadth and depth of research in health games will have powerful impacts on all stages of life, from infants with autism to geriatric patients wanting to extend their active lives," says Editor-in-Chief Bill Ferguson. "These advancements will impact the nature and availability of preventive and remedial care from physicians to therapists to self-management. The Journal will be a powerful voice for the researchers and clinicians, as well as a resource for state-of-the-art developments for everyone concerned with human well-being."